In 1991, Northern Ingredients was founded as a one man, one forklift, one van company in a 1500 square foot rented warehouse. Paperwork covered the dining room table. The founders six and ten year old daughters cleaned the warehouse, washed the forklift, answered phones, and sent out UPS shipments. By October 2000, the company owned its first building. With an eye towards expansion, four Northern Ingredients employees purchased Oziama International. Oziama, now over 25 years old, is a primary distributor for the full line of Cargill starch, sugar, citric acid, salt, cocoa, and gluten. Oziama services the largest meat, dairy, and seafood processors in Minnesota as well as Fortune 500 food manufacturers in the four state area bordering Minnesota. In January 2010, to once again dramatically broaden our product offerings and available services, four Northern Ingredients employees purchased Northwestern Foods Inc. (NFI). Founded in 1977, NFI is an BRC Issue 6 certified dry blender that produces and packages bags and boxes of customer specified mixes ranging in size from 7 grams to 2,000 pounds. NFI uses three degreed food scientists to collaborate with its customers to produce mixes that meet the customer’s needs. Positioned for growth and looking forward to serving more customers, we operate as a trio of integrated companies with common ownership. We call ourselves The N2O Companies (Northern Ingredients, Northwestern Foods, and Oziama). We value FUN, N2O is the chemical symbol for nitrous oxide (laughing gas). 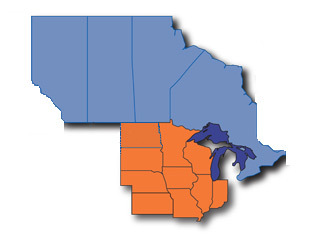 We serve the Upper Midwest along with the adjoining four Canadian provinces. We have plenty of room for product extensions and additional inventory in our employee owned 100,000 square foot building. We have a strong commitment to food safety and to building a food safety culture with all our employees. We have a Global Food Safety Initiative (GFSI) compliant Food Safety Management System. We hold a certificate to the British Retail Consortium (BRC) Issue 7 Global Standards and are audited by American Institute of Baking (AIB) to ensure compliance.